Marriage is a great thing. Certainly, it can be challenging, but usually, for Sandy and me, at least, it can be pretty funny. Especially the things we squabble about. As of the night I am writing this, we have been married for 2049 days. This means that at least 2000 times, Sandy has glared and me and growled "You know, I WILL organize the pots and pans cupboard, and YOU WILL learn to put them away properly." The only days she hasn't said this: vacations, Christmas, anniversaries, one or two of my birthdays, the days our kids were born, and a random Tuesday in 2012. This morning, when I got the traditional stinkeye yet again for just tossing something in wherever, I can't help but look at her and smile as she got madder and madder. "It isn't funny!" she exclaimed as she walked across the room to give me a well-deserved peg in the arm. Of course this just made me laugh harder, which finally got her to crack. Love it. 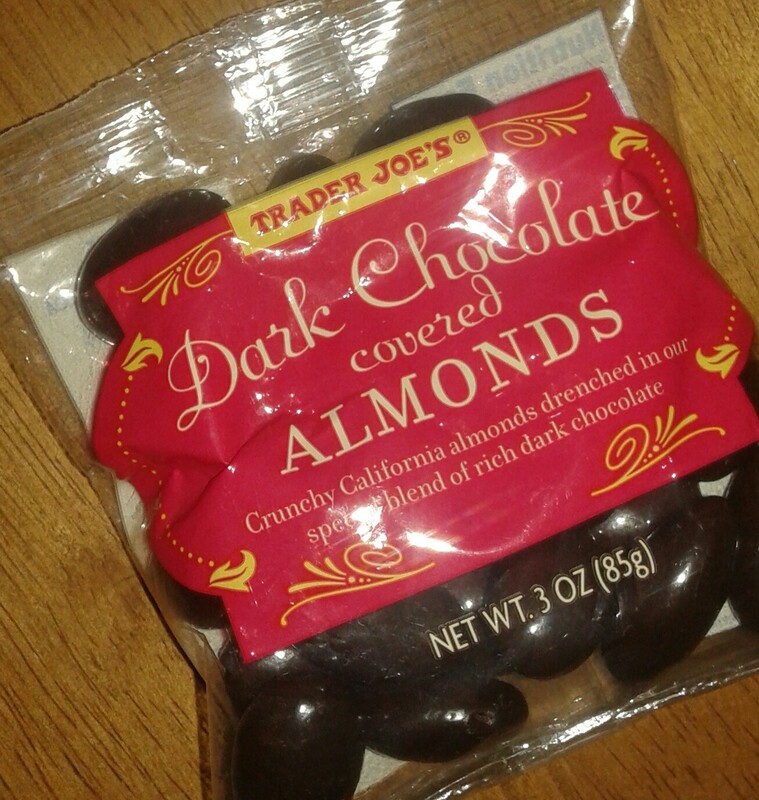 Another thing I did that made her mad recently: I ate her baggie of Trader Joe's Dark Chocolate Covered Almonds. Didn't matter it had been in the fridge for two weeks and I thought I made the safe assumption she had forgotten about it. Didn't matter that, when busted, I was hard at work patching up the plaster on our third floor so it'll soon be the TV/family room. She wanted her bath with her book, her iced water and her chocolate almonds, and HOW DARE I deprive her of that. Guilty. Eh well. These are some pretty tasty little choco-nutties, well worth the spousal ire I drew. That being said, they're pretty straightforward, without any fancy little wrinkles. Chances are, if you're imagining a typical dark chocolate almond, that's exactly what these TJ offerings taste like. There's a thin soft coat of bittersweet chocolate enveloping each crunchy nut, presenting a smooth bite that's pretty palatably pleasing. To my taste, the chocolate seems a lot more sweet than bitter, but I've grown pretty accustomed to the super dark stuff, going as far as beginning to enjoy raw cocoa nibs, so my scale might be a little off from yours. Regardless, for a potent little snack that satisfies some candy craving with some protein oomph to keep you going, it's tough to beat these, especially for just 99 cents. 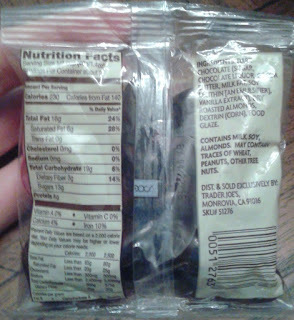 Quick word: Nuts + dark chocolate = lots of fat and calories. Including saturated. These are no exception. My take: I've lost significant weight in the past year on a Paleo diet, which these kinda almost fit into, sort of. It depends on what camp you put dark chocolate in - I give it a pass. Not once in the past year have I sat down and counted calories or doublechecked how much fat I'd eaten in one day, and there's been numerous times I've had more than the couple handfuls of almonds or more chocolate than what's covering these nuts in a day. If the fat and calories concern you, make note and choose consumption accordingly. But for me I don't consider them a dietbreaker, or even that much of a cheat, as long as (like anything else) I consume them in moderation. Anyways, both Sandy and I love them, and to try and keep the peace, last shopping trip I bought four bags of them, two for me, two for her. So far, so good. I might even be nice and share my last bag with her, especially when she starts up about those pots and pans again. Distraction is key for survival. Double fours from us. Thanks for your posts. I love TJ! Good, but I prefer their Dark Belgian Chocolate Covered Almonds, 73% Cacao. I wonder why not they do cookie butter covered almonds? White chocolate with cookie butter mixed in and then panned on. Spend some real money on a peace offering: Sjaak's chocolate covered hazelnuts. I think they also have almonds. Vegan, in both dark chocolate and vegan milk chocolate versions. The hazelnut ones are little balls of wonder, and I say that not even being a chocoholic. They have a kind of powdery coating on the outside. But basically, almonds go with everything, sweet or savory. Hence my huge collection of Blue Diamond varieties (stocked up when on sale). You can certainly justify chocolate almonds as an important source of protein and good fat.... Of course.